In A Small Corner Of YouTube, A Web Star Is Born As the entertainment world fragments across a growing number of platforms, some of the biggest winners have been rogue, online video personalities and producers. 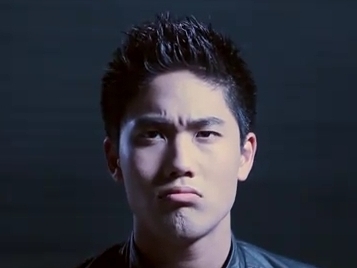 But even with 3 million followers on YouTube, Ryan Higa isn't exactly a household name. Agents of Secret Stuff stars YouTube celebrity Ryan Higa as a spy operative who finds himself somewhat out of place when he's assigned to go undercover at a high school. Through YouTube, fans can find stars they can more easily relate to who may be ignored by Hollywood. At this moment, there is one YouTube celebrity with more subscribers than anyone else. It's not Lady Gaga. It's not Justin Bieber, either. More than 3 million fans on YouTube have signed up to receive updates and videos from Ryan Higa, a college student in Las Vegas, who was raised in Hilo, Hawaii. Higa's big appeal is a wacky brand of viral comedy that connects with Web-savvy teens. "As long as I can remember, I've been training to become an A.S.S. — an agent of secret stuff," Higa's character, Aden, tells viewers at the start of Agents of Secret Stuff, a 35-minute action-comedy set in high school. This piece is part of NPR's Fractured Culture series. The straight-to-YouTube mini-feature follows the mishaps of a covert, socially maladjusted hero who must save a classmate from impending threats. The video features a who's who of YouTube stars, and it's clocked well over 8 million views in the past two months. As the entertainment world fragments across a growing number of platforms, some of the biggest winners have been rogue, online video personalities and producers. YouTube is a central platform, and many of its best-known stars, like Higa, happen to be Asian-American. Some say it's an example of an ignored audience now getting "hyperserved." Wong Fu Productions, a production house based in Pasadena, Calif., directed, co-wrote and co-produced Agents of Secret Stuff with Higa, and has worked with him on shorter comedy sketches in the past. Wong Fu Productions was started by three friends — Ted Fu, Wesley Chan and Philip Wang — at the University of California, San Diego. By the time they graduated in 2006, they say their fan-base had grown too large to abandon, so they kept making Web videos and eventually linked up with others who were pushing the envelope on YouTube-oriented production. "People, especially through YouTube, they're finding types of entertainment that are just from people that are just like themselves — or people that they can relate to a little bit better than some unattainable movie star or TV star," co-founder Wang says. "And so when they see people like Ryan, or they see people like us, it's someone that they feel a more personal connection to." Today, this scene is also starting to draw talent from the entertainment establishment. Another company, Digital Artists, of Venice, Calif., reflects a new front in the war for attention. Digital Artists was created by two veterans of the Hollywood scene, Adam Shaw and William Kendall. It partnered with the makers of Agents of Secret Stuff to release a special edition of the movie for iTunes, as well as mobile apps. For whatever reason, the studio system is not creating, in this case, Asian-American celebrities, so fans of Ryan have actually elevated him to that level through their own means. "You know, when you start being able to regularly generate 5 to 10 million views of things that you produce — you can't ignore that," CEO Adam Shaw says of the new wave of YouTube celebs. Stars like Higa can earn up to six-figure incomes, annually, based on ads YouTube pairs with their videos. George Strompolos used to cultivate this online video talent in his former job at YouTube, where he was a strategic partnerships development manager. Now, he's formed Strompolos Digital Media and is working with many of the same stars as a producer in Los Angeles. "It's not all a Hollywood ecosystem anymore," Strompolos says. He adds that YouTube celebrities succeed by catering to "a number of hyperserved niches." "For whatever reason, the studio system is not creating, in this case, Asian-American celebrities, so fans of Ryan have actually elevated him to that level through their own means," Strompolos says. "In this case, that's through YouTube and through the Internet." (Left to right) Ted Fu, Wesley Chan, Philip Wang — co-founders of Wong Fu Productions. "People, especially through YouTube, they're finding types of entertainment that are just from people that are just like themselves — or people that they can relate to a little bit better than some unattainable movie star or TV star," Wang says. If you're wondering just how this differs from old-school notions of fame, Chan, of Wong Fu Productions, can explain: "What defined a star before was if they were untouchable. If a star was so beyond belief, so larger than life, it made them a superstar, blockbuster. This day and age, it's quite the opposite. A star is someone that you can relate to. Someone you can follow on Twitter, someone, you can read their blog. ... Someone that's very everyday, and ultimately about relate-ability — I think that kind of star is kinda what's taking over now." William Kendall, chief creative officer at Digital Artists, says this new talent can quickly expand a small niche worldwide because of the borderless nature of the Internet. "They're the future of content creation," Kendall says of the indie, digital producers, "so that's where we're placing our bets." But even Wang, of Wong Fu Productions, will admit one downside to the newer pathways to stardom. "I think this is also a generation where everyone feels they can be famous. Everyone wants to broadcast their life and try to get attention some way or somehow," he says. "We have lost a little bit of the classy kind of stars, from the Frank Sinatra or Gene Kelly age." But as Ol' Blue Eyes might say, in the YouTube age, it's still about doing it "My Way."